This post is a little different than most of my other recent trail reports because it covers some hiking I did that is beyond just thru-hiking the Mountains-to-Sea Trail (MST) across North Carolina. 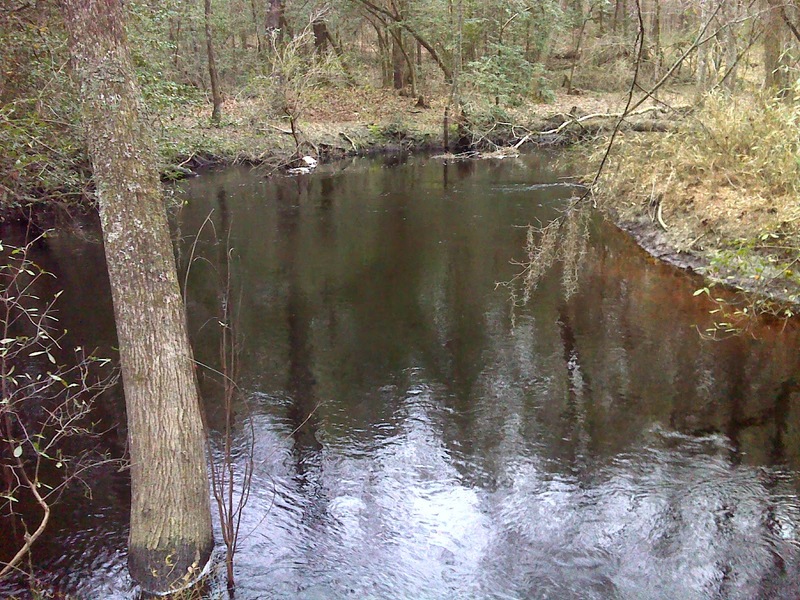 Being somewhat of a pioneer for the new Cape Fear Arch-Onslow Bight route for the MST I sought to explore some alternate routes in the area around Jones Lake State Park and adjacent Turnbull Creek Educational State Forest. In the former (Jones Lake area) I found a possible future route with some great potential but requiring a bit of trail building. But on the latter expedition, I struck the jackpot--a real gem of a route right along Turnbull Creek on well maintained interpretive footpath that can be hiked as-is today, though only during the times when Turnbull Creek Educational State Forest is open. I'm recommending this route as the preferred option for hikers. 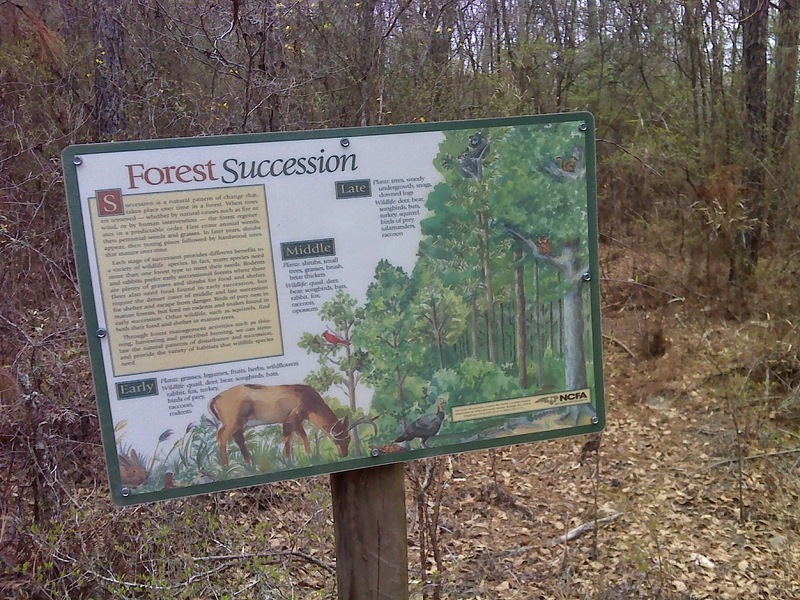 Turnbull Creek Educational State forest is an underfunded over-performing 890 acre patch of North Carolina woodland. Within it is a 4.5 mile trail they simply call the Long Trail. Almost half of it is a to-die-for walk beside Turnbull Creek itself, complete with a couple of elaborate foot bridges, rest-stop benches and many interpretive signs. 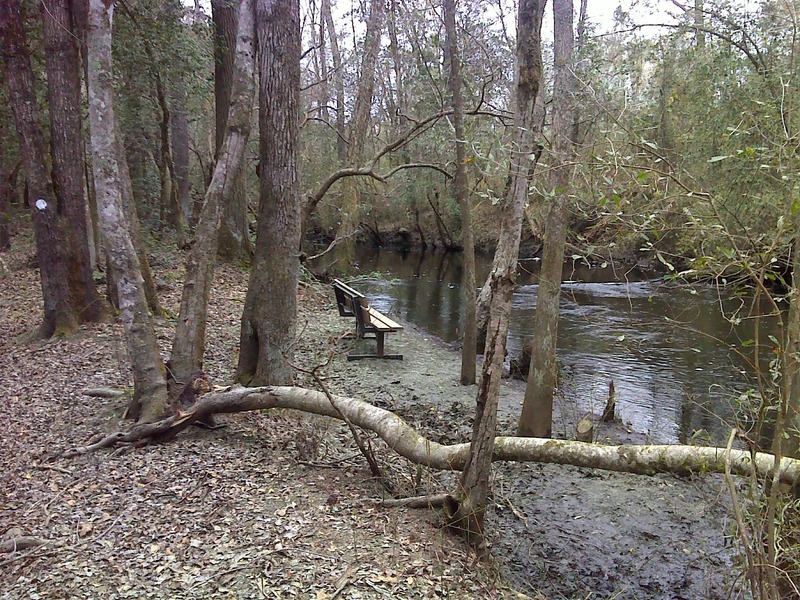 The problem: Turnbull Creek Educational State Forest is closed from Mid-November to Mid-March. It's also closed on weekends and is only open weekdays between 8AM and 5PM. When the Forest is open, I highly recommend the route through it. The forest route is 1.88 miles and replaces the alternative road walk on Sweet Home Church Road, which is 1.38 miles of quiet paved road. In order to access the more remote end of the Long Trail there's a crossing of Turnbull Creek (the blue 'pin' on the right side of the map above) that needs to be accomplished where an old road used to cross, but where the bridge is now missing. Fortunately there's a living, sturdy fallen tree that provides an easy crossing, including living branches that provide stable hand-holds. Alternatively it's only a short ford wading the creek. 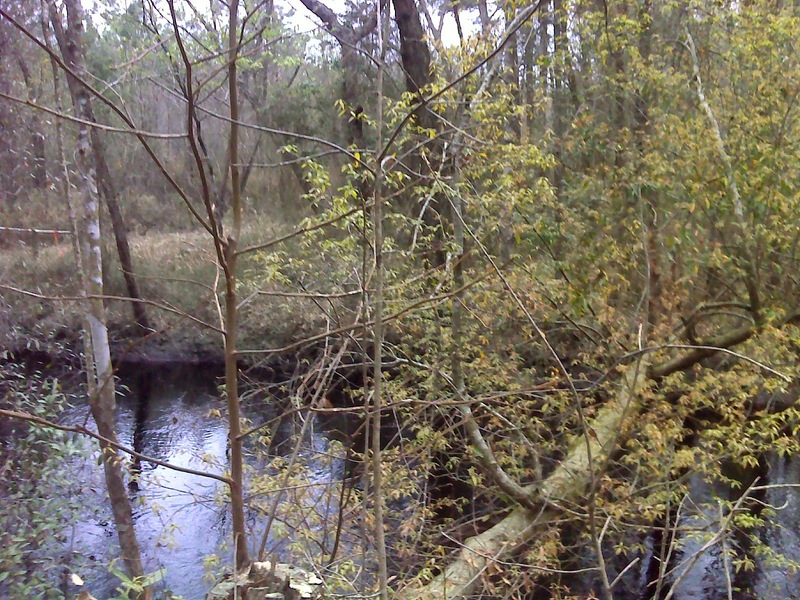 Living fallen tree just downstream of former bridge. Easy crossing with living branches for hand-holds. Because the MST can bring visibility (and visitors) to Turnbull, designating this route as the official MST route (when it's open) would be a great asset to them. There's plenty of precedent for an official trail route that is only open certain hours. The only white-blazed Appalachian Trail route passes through Bear Mountain Trailside Zoo, New York, which is only open between 10AM and 4:30PM. All other times the hiker must follow a blue-blazed bypass. Being a hard-core purist, when I hiked this area, I had to rearrange my plans to be able to pass through when it was open. Hopefully in the future, the park management can find ways to keep the trail open for longer periods. Perhaps they will even be able to build a footbridge over Turnbull Creek where the old road bridge footings are still in place. 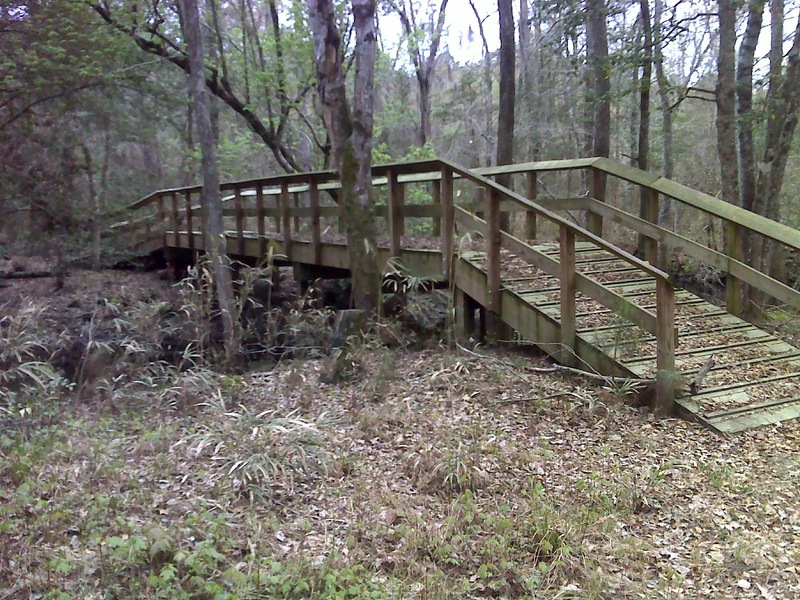 It would be no more elaborate of a project than two foot bridges that they have already built for the Long Trail itself. Take a look at the annotated photos in the slide show for more info. Remote and unspoiled Salters Lake seen from the only access point at the end of the 1.5 mile Salters Lake Trail, part of the proposed future MST route. 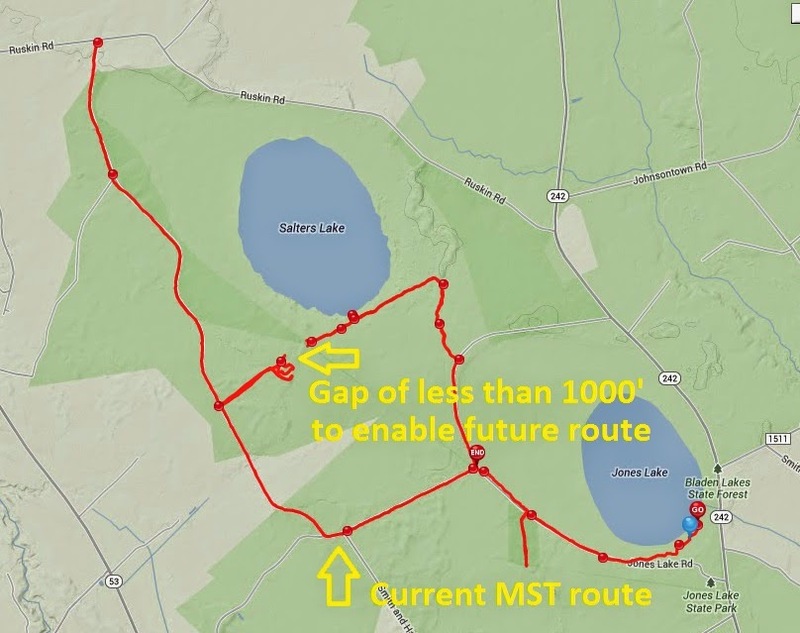 Here I hiked both the current MST route and a promising possible future route through Jones Lake State Park and adjacent Bladen Lakes State Forest Game Land past Jones Lake and Salters Lake. Long ago there was a road, still identified on many maps including that stored in my GPS and that given by my North Carolina map book published by DeLorme, called Jones Lake Road, which extended roughly northeast to southwest from Ruskin Road, passing the east end of Salters Lake, and coming out at the Bladen Lakes National Forest woods road called Salters Lake Trail. 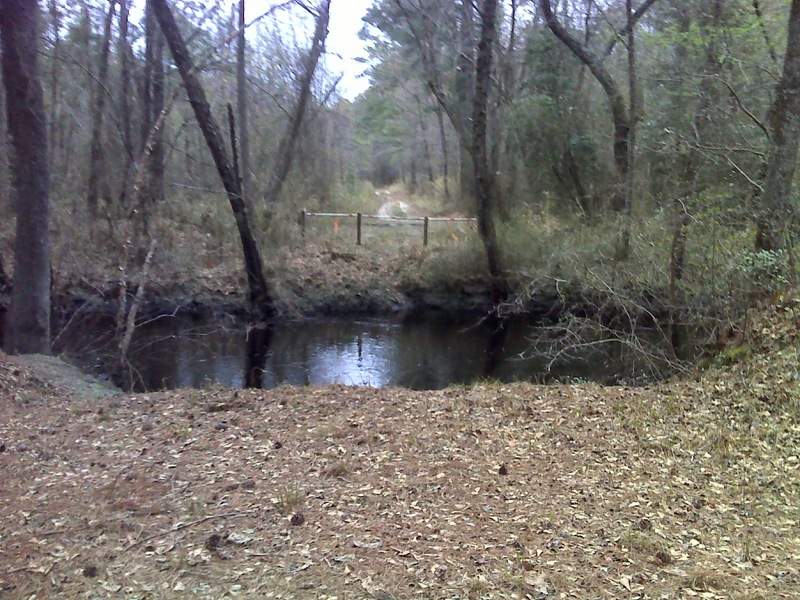 Every bit of this road is still maintained with the exception of about 1000 feet crossing the wetland along the Salters Lake outlet stream, and even that crossing is kept open and maintained by Jones Lake State Park as a border monitoring trail. Now ... if future trail enthusiasts could convince the authorities to allow them to build a bit of boardwalk across the wettest part (a hundred yards or so) and then clear some trail to the end of the forest road in Bladen Lakes State Forest Game Land (see the details of the GPS tracks provided here), it would open up a route in which the MST could make use of half of the four mile Bay Trail circuit around Jones Lake and all of the 1.5 mile Salters Lake trail, including a nice piece of boardwalk. Presently the MST route can use only a mile of the Bay trail before being required to 'bail out' and head into Bladen Lakes Forest on woods roads. 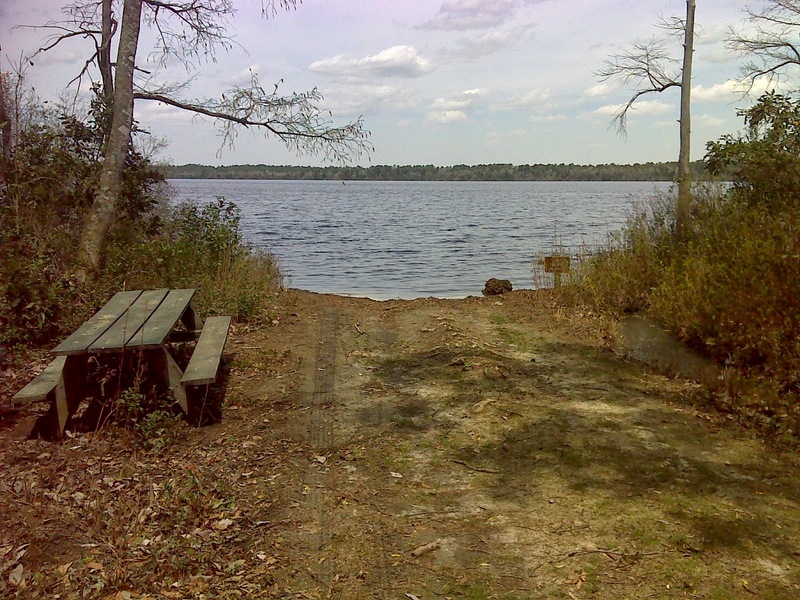 It's not an unpleasant route, but the hike past totally unspoiled Salters Lake, including access to it via dedicated foot trail and a rest stop beside the lake at a picnic table, would be a significant future enhancement. Check out the slide show for a more visual look at the experience.